MANILA, Philippines - Vice President Jejomar Binay conceded to presumptive president Rodrigo Duterte on Thursday, May 12. Vice President Jejomar Binay congratulates Rodrigo Duterte. In a statement sent to media, Binay's communications director Joey Salgado said Binay wants to extend his congratulations to Duterte. "We confirm that Vice President Binay has talked to President-elect Duterte. He extended his congratulations and wished the president-elect all the best," the statement reads. On Monday night, Binay said he will not be conceding defeat until the final release of the results of the 2016 elections. "I have repeatedly called for respecting institutions and the democratic process. Once the process is completed, we should always respect the outcome. 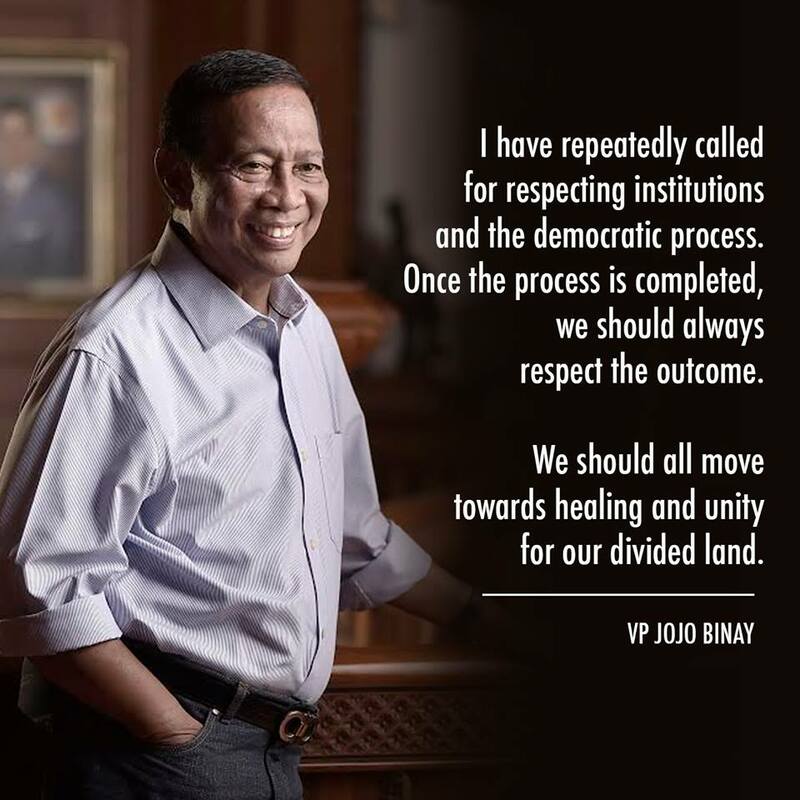 We should all move towards healing and unity for our divided land," said Binay. In the latest partial and unofficial results as of 10:45 p.m. today, Binay ranked fourth among the presidential candidates having 5,313,561 votes. Duterte is a sure winner with 15,915,525 votes ahead of former DILG Secretary Mar Roxas (9,681,771) and Senator Grace Poe (8,929,826). Poe was the first to concede late evening on May 9. Roxas followed afternoon of May 10.